There's no need to drive or look for parking when you visit Waikiki. 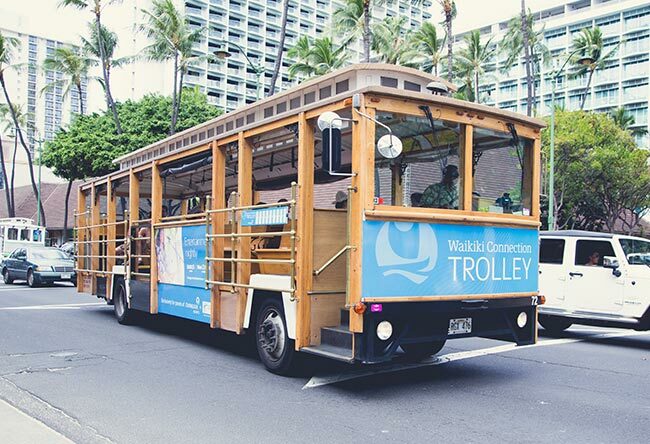 Getting around the city is simple, fun and easy with the Waikiki Connection Trolley. Hop aboard for a comfortable ride to eight different locations where you can hop off to discover many of the top attractions in and around Waikiki. Ride to the hiking trial at the awe-inspiring Diamond Head Crater, go shopping at the Ala Moana Center or get off and explore Kapiolani Park. Riding on the Waikiki Connection Trolley is so easy. It stops several times a day at the Duke Kahanamoku Statue, just steps away from the Waikiki Beachcomber hotel, and is free for all of our guests. Included amenity with Waikiki Beachcomber Connection. The Waikiki Connection Trolley runs from 7am-6:30pm daily. Where does the Waikiki Connection Trolley stop? The trolley stops at eight different points of interest in and around Waikiki. Hop aboard at the Duke Kahanamoku Statue, just a five minute walk from the Waikiki Beachcomber, then ride to visit top attractions like the Honolulu Zoo, Waikiki Aquarium, Kapiolani Park, Diamond Head Crater, the Diamond Head Crater Lookout, Ala Moana Makai, and the KCC Farmers Market. What is the Waikiki Connection Trolley schedule? The Waikiki Connection Trolley runs daily from 7am-6:45pm, with the first stop at Saratoga Road. The closest stop to the Waikiki Beachcomber is at the Duke Kahanamoku Statue, just a five minute walk (.2 miles) from the hotel. Trolley service begins from the Duke Kahanamoku Statue at 7:07am, with trolleys arriving approximately every 30 minutes until the last stop of the day at the statue location at 6:39pm.